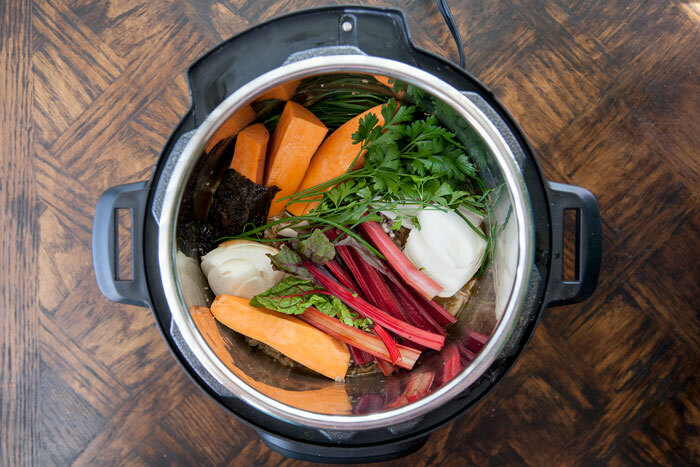 A good broth is a beautiful thing – a magical culinary elixir that extracts the hidden goodness from bones and other kitchen scraps… Food that would otherwise go to waste, but that still has deep flavor and powerful nourishment to offer. 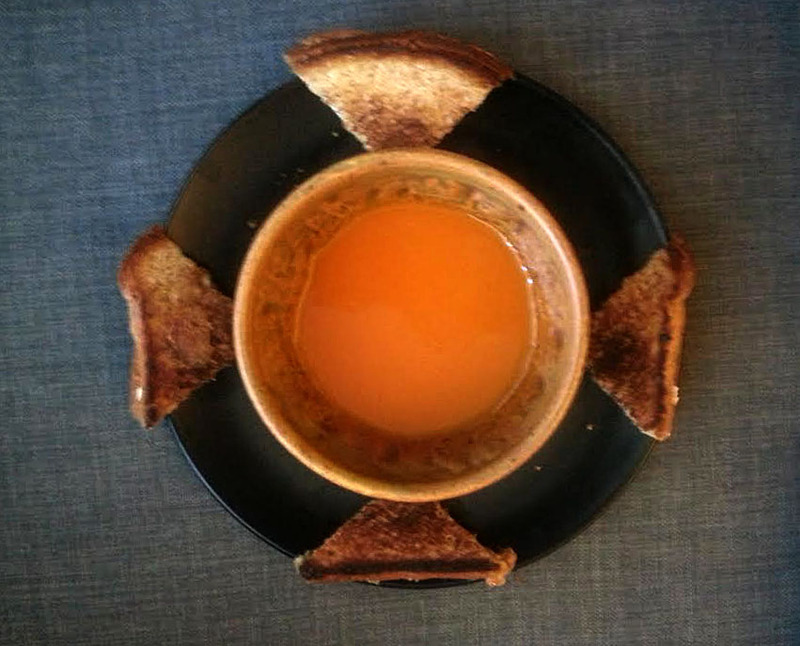 Broth is an ancient food. It’s been around as long as people have boiling food in water. Long-simmered stocks made from vegetables, meats and bones have a history of recognition for not only their culinary value, but also their nutritive merits. Humans have a long tradition of strengthening weak constitutions with broth, from its use by early nutritionists as an inexpensive protein-sparing diet staple for the malnourished, to everyone’s favorite cold remedy – chicken soup. 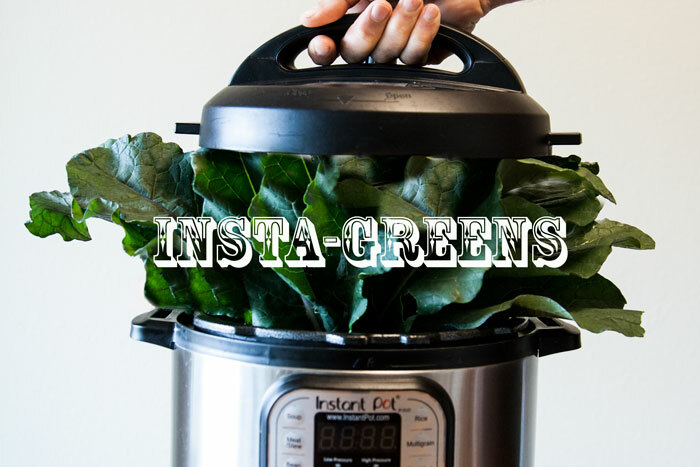 In my last post on Food Prep Strategy, I mentioned the latest positive influence that Instant Pot‘s glorious set-it-and-forget-it convenience has graced upon my cooking routines… something I like to call INSTA-GREENS. Really, it’s nothing more than batch-cooking my leafy greens, but in my eyes it’s become an anchor of my weekly self care routine. A simple task that makes me feel like I am treating myself right. Author MaryPosted on May 30, 2017 February 3, 2019 Categories Instant Pot, IP Gluten Free, IP Paleo Friendly, IP Vegan, IP Vegetarian, Logistics, Nutrition Science, Recipes, Sides, Vegan, Vegetables, Vegetables & Sides, VegetarianTags [Instant Pot] Gluten Free, [Instant Pot] Paleo Friendly, [Instant Pot] Vegan, [Instant Pot] Vegetables & Sides, [Instant Pot] Vegetarian, collard greens, greens, Instant Pot, kale, pressure cooking, swiss chard9 Comments on [Instant Pot] Insta-Greens! Let’s talk about eating logistics. 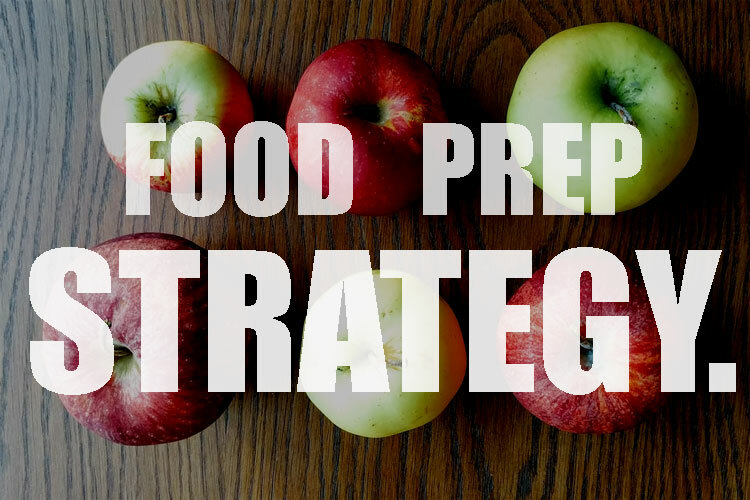 If you like to eat fresh/whole/minimally-processed/REAL food, you have to plan, shop, and cook. It takes some time and effort, but it is an essential form of self-care. Luckily, since we have to eat every day, we get a lot of practice at this task. With experience, we optimize. We can get better at working smarter, not harder. Done properly, getting systematic about your Food Plan can improve your quality of life. It can save you time, money and stress. It can help you align your goals with your reality. It can streamline your efforts, freeing up your creative energy for bigger and better things, while keeping yourself well-fed and SANE. I wouldn’t believe it myself if I didn’t have the traffic analytics to prove it, but there’s no denying it… pressure cooking is hot. And I’m not just talking about the elevated boiling point of water inside the powerful, pressurized contraption that you’ve been convinced to invite onto your kitchen counter! Trust me, you won’t regret it. 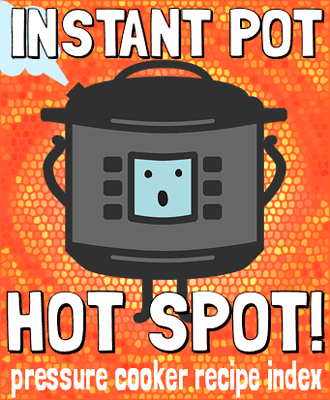 Since I first got acquainted with Instant Pot a couple of years ago, it’s been a constant companion in my cooking adventures. My pressure cooking recipes weren’t always the biggest draws on this site, but these days things are different; I can tell I’m not the only one obsessed with this multi-talented cooker. Since it looks like there are a lot of people enamored with their new toys this season, I’m taking a moment to help you spread some holiday cheer. If someone in your life is hooked on cooking under pressure, show them some love with these must-have tools and accessories. First things first: the cooker! When I started shopping around for an electric pressure cooker, Instant Pot was the obvious choice for me – stainless steel liner, programmable cooking, even yogurt mode… here’s my review if you want to read more about how great it is. I have Instant Pot DUO, and since my purchase they’ve also released Instant Pot SMART, which has the benefit of fully customized cooking programs controlled via Bluetooth from your smartphone. Fancy! If your cooker didn’t already come with one, definitely spring for the glass lid – it’s a nice alternative to the pressure lid for slow cooking and keep-warm mode. It’s also nice to have an extra gasket, as they wear out over time and can have a tendency to retain strong cooking odors. Another surprisingly handy tool is an extra inner pot; it makes it easier to use your IP for multiple courses (eg. after slow-cooking an entree, you can swap out the extra pot for a quick batch of rice to serve alongside). You can really expand your pressure cooking options with a simple steamer basket. Practically anything you would steam on the stovetop (veggies, dumplings, artichokes) comes out faster and with more flavor locked in under pressure. If your gift-ee is a fermented foodie like me, they’ve got to be excited about Instant Pot’s yogurt maker mode! 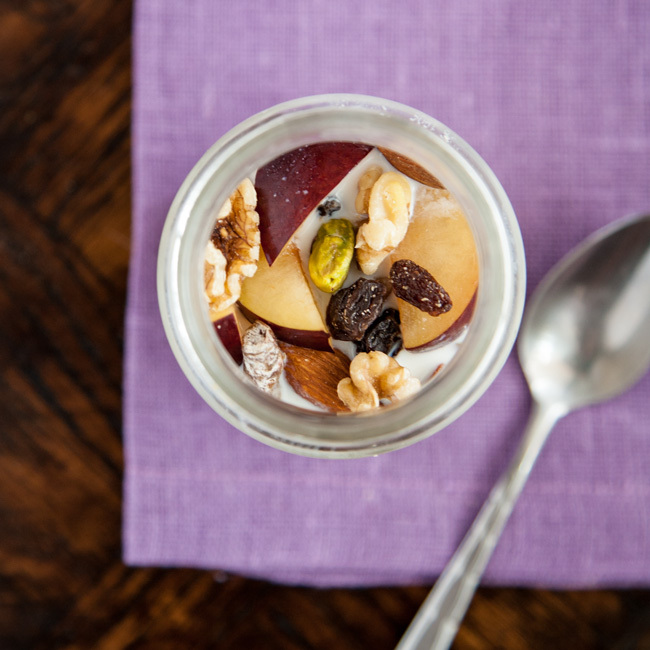 Enhance your yogurt endeavors with a set of glass jars; you can make yogurt in any sized container you like (including right in the pot itself) but my favorites are pint-sized jars with a wide mouth. You’ll need a thermometer for ensuring the milk has cooled enough to add the cultures after scalding, and canning tongs are also really useful for removing hot jars from the cooker. If your favorite Instant Pot Fan prefers their yogurt Greek style, this special strainer will help them concentrate their home-made yogurt into thick, creamy perfection. Not into yogurt? How about expanding their healthy cooking repertoire with some fancy dried beans? Pressure cookers make short work of dry legumes, and Rancho Gordo offers the best heirloom varieties. This sampler pack has 5 exotic types of beautiful beans. Finally, let’s not forget about books: my top two picks are Hip Pressure Cooking and The New Fast Food. The former, by our generation’s top pressure cooking guru Laura Pazzaglia, provides a wealth of information to help new users get their bearings, along with plenty of fresh recipes with a chic European aesthetic. The latter, by the Veggie Queen herself Jill Nussinow (a fellow registered dietitian! 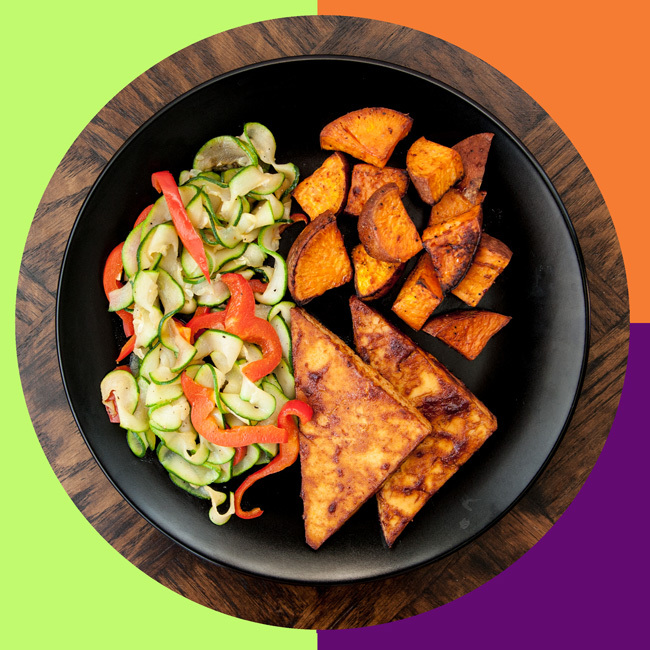 ), focuses on healthy vegetarian recipes, so it’s a great resource for my favorite kind of everyday cooking. 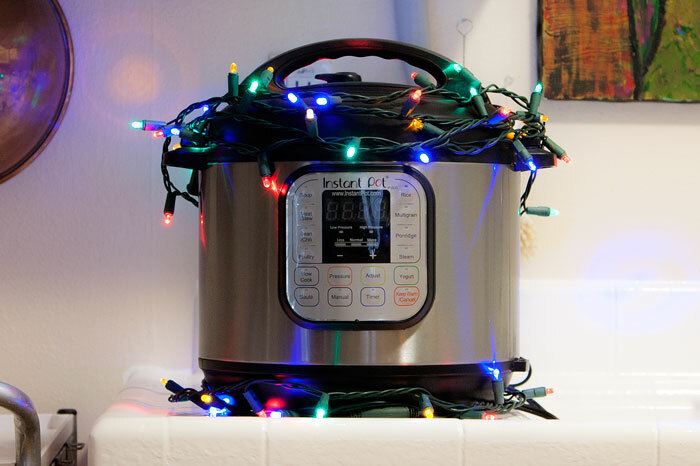 The only caveat is that Nussinow prefers traditional stovetop pressure cookers over electrics, so for use with Instant Pot, you’ll have to be mindful of the cooking instructions and make some adjustments. It’s not that difficult once you get the hang of it, but it may not be the easiest choice for beginners. I hope these picks will help make some spirits bright among my fellow Instant Pot devotees. Readers, if you’ve come across any other tools or accessories that make pressure cooking more fun, please share! Anything else you would add to the list? We’ve been culturing a deep appreciation for sourdough here at flavorRD! We started with a crash course on sourdough’s history, science and nutrition benefits, followed by the how and WHY of getting your starter started. This week, I’m finishing the series by walking you through my weekly sourdough baking ritual, and sharing some of my favorite recipe successes from my experiments so far. Take the starter out of the fridge, pouring off any liquid that has accumulated on top (this is alcohol from the yeast’s slow fermentation!) and giving the rest a quick stir. Divide the starter into two halves – set one aside for baking, and leave the other in your ‘crock’ (FYI: mine is just tupperware) to continue your culture. Use a kitchen scale* to weigh 4 oz. 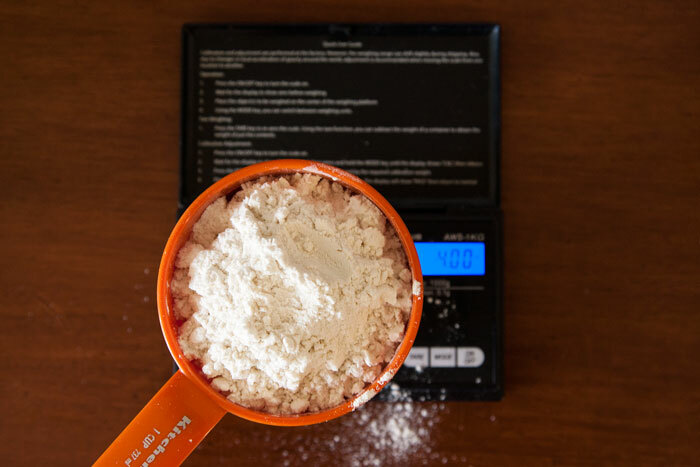 flour** and 4 oz. water, and stir them into the remaining starter in the crock until smoothly combined. Allow it to sit, covered but not airtight, at room temperature for 2 hours before returning it to the fridge. This gives your microbial friends some time to eat before going back to ‘sleep’ for the week. Take the other half of the starter that you set aside, and use it in a tasty recipe! It can often be used in this “unfed” state (ie. in baked goods that either don’t need to rise much, that involve a pre-ferment, or in quickbread type recipes that include another leavener like baking powder/soda), but if you want it to be powerful enough to leaven bread, you’ll want to give this half its own feeding as well. To give it some extra “oomph,” feed the discard starter with 4 oz. flour and water just like in the last step, and let it hang out for about 12 hours before baking. If I’m planning to bake bread on Saturday, I usually take my starter out on Friday night, split it, and feed both halves. Then after 2 hours, I put one half back into the fridge for next week, and leave the other half out overnight to continue fermenting until I’m ready to bake the next morning. * I actually use this inexpensive + very precise pocket scale! ** I usually feed my starter with unbleached all-purpose flour, which yields the most reliable results. But once every few weeks I prefer to liven things up with a feeding of whole-wheat flour instead. And finally, what we’ve all been waiting for… the recipes! Pizza Crust: I’ve already mentioned (and teased on Instagram) my obsession with crafting the perfect whole grain sourdough crust for pizza night. Recipe testing is still in progress, but you can definitely look forward to seeing the results here once I get it dialed in. Pancakes + Waffles: Weekend breakfast turns your sourdough ritual into an opportunity to show your household some love. This basic recipe from King Arthur Flour has an overnight rise with buttermilk, and comes out superbly light and fluffy. I substitute whole-wheat pastry flour instead of the all-purpose stuff, with great results, and it’s also a good foundation for customizing variations with your favorite mix-ins. In fact, I have a new seasonal specialty coming your way soon! Biscuits: I’ve only experimented with sourdough biscuits once so far, but they definitely warrant further study! I tried a variation on this cheddar biscuit recipe from Cultures for Health (great resource for all things fermented), and although it came out a little more like a dinner roll than a fluffy/flaky biscuit, we still ate them enthusiastically. The dough is marbled with sharp cheddar, black pepper and garlic, which I was compelled to enjoy savory-sweet style: topped with a drizzle of honey. Next, I’ve got my sights set on these cheddar-chive beauties. Seed Bread: When I wrote last week about my motivations for starting a sourdough habit, there was another bullet point that I should have included: because I am addicted to sourdough seed bread! I first got hooked on the version they sell at the bakery department at Sprouts, and then when I found this recipe from Smart Nutrition (one of my all-time-fave RD bloggers) I’m pretty sure it was seriously the tipping point that inspired me to adopt my new sourdough pet. I add hemp seeds to mine, and it is outrageously good. Readers, now it’s your turn: tell me about your sourdough! What are your best tips and must-try recipes? Let’s talk about breakfast. Weekday Breakfast, to be specific, which is an entirely different animal than the leisurely, unhurried, coffee-sipping pleasure-breakfasts that we get to enjoy on the weekends. Weekday Breakfast, for better or worse, is about taking care of business: supplying ourselves with an adequate amount of the right balance of nutrients to fuel ourselves for the workday, and doing it quickly. To be honest, I struggle with Weekday Breakfast. When I drag myself out of bed for work, I don’t have much of an appetite. It’s just hard to get my morning-brain interested in the fuel that I know my body needs. The good news? Recognizing a problem is the first step in doing something about it. 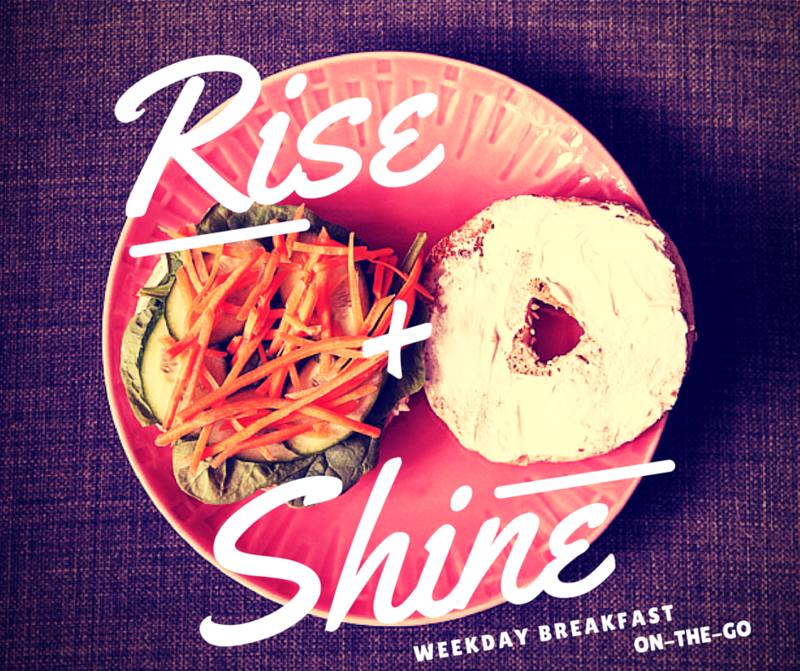 I started with a dedicated Weekday Breakfast Pinterest board to help inspire my efforts. I also took a critical look at my morning routine, and found that although it may not be the best approach for mindful eating, I really have the best success when I schedule my breakfast time either during my commute or at my desk (whatever works!). And there’s one other critical element that should go without saying: that healthy breakfast also needs to be a tasty treat… otherwise, what’s the point? So now, after some brainstorming and field-testing, I’m coming here to share my top 5 healthy, quick, on-the-go balanced breakfasts that keep me powering through my weekdays! 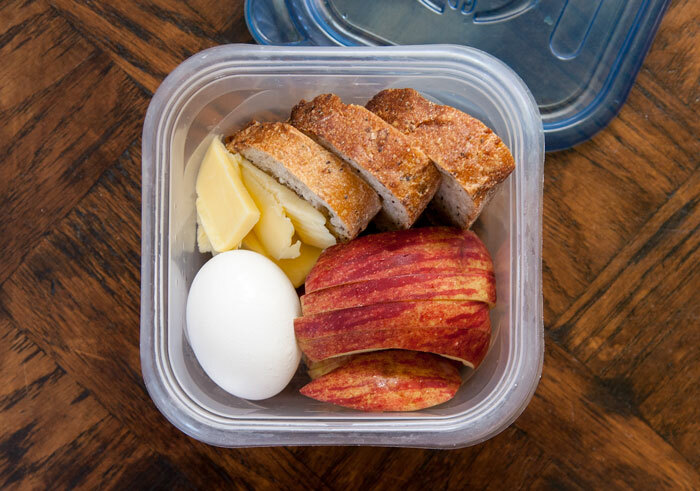 This is sort of a DIY version of the protein bistro box from Starbucks; I developed a taste for those during my time-crunched grad school days, but this make-at-home version is a lot easier on the budget. It also works well for my breakfast ambivalence because I can pick at little nibbles of this and that, and I still end up with a balanced meal. My basic formula is whole grain bread (the seed-packed sourdough stuff pictured above is my current favorite), cheese, fruit, and a boiled egg – but the mix-n-match system is a good way to use up whatever odds and ends you have on hand. 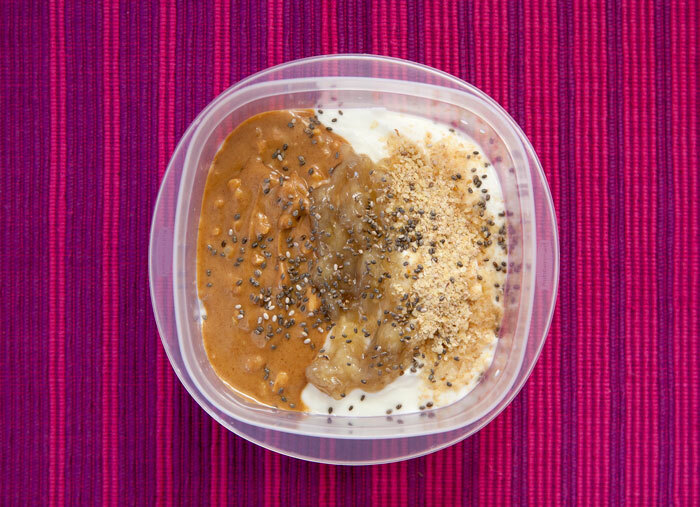 Pack it all into a medium-sized tupperware container, and you have a balanced snack-breakfast, wherever your day takes you. This is a really common fallback weekday breakfast for me, for two reasons. First, I pretty much always have these 4 ingredients stocked in my kitchen, and second, it’s something that will actually pique my meager morning appetite. 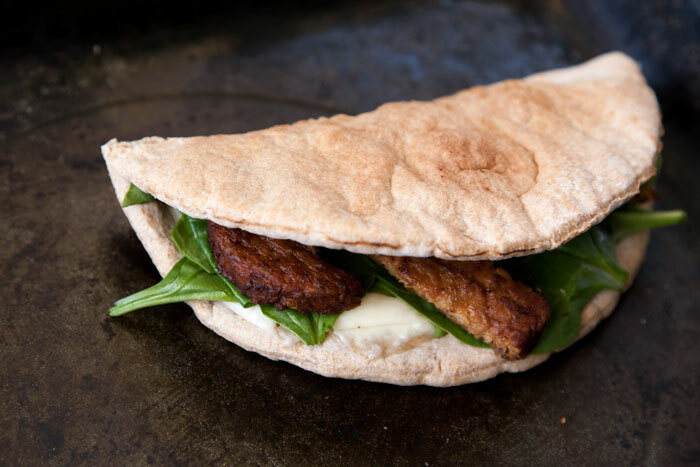 Use a slice (or half slice) of regular or lite cheese of your choice to cover half of a whole-grain pita bread. Place it under a broiler or in a toaster oven until melted/crisp, then add a handful of spinach and a vegetarian sausage patty (I cut mine up into a couple of slices to cover the whole sandwich). Fold it in half, wrap in a paper towel, and you’re good to go! Have you been disappointed recently by the new PBJ flavored Greek yogurt from Trader Joe’s? If it sounded really good in your head, but didn’t meet your flavor expectations, it’s time to take things into your own hands. 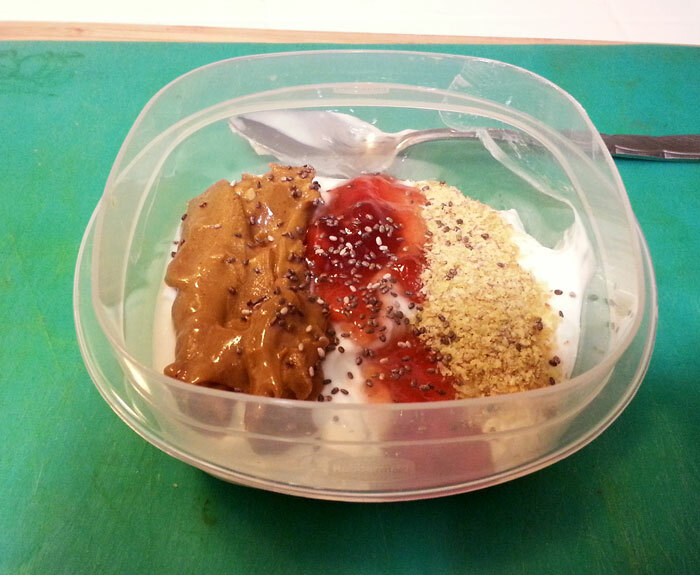 I already talked about this perfect combination of plain yogurt, PB/J, wheat germ and chia seeds in my post on Eating Well After Oral Surgery, but it truly has earned a space among my go-to morning meals/snacks. For an extra-special breakfast, try it with my favorite banana jam recipe! Here’s another savory sandwich that will help you get a head start on your daily servings of veggies. Baking a weekend batch of my garlic kale & feta bagels will give you an even ‘veggier’ foundation, but most of the time I use the whole wheat sprouted sesame bagels from Trader Joe’s. 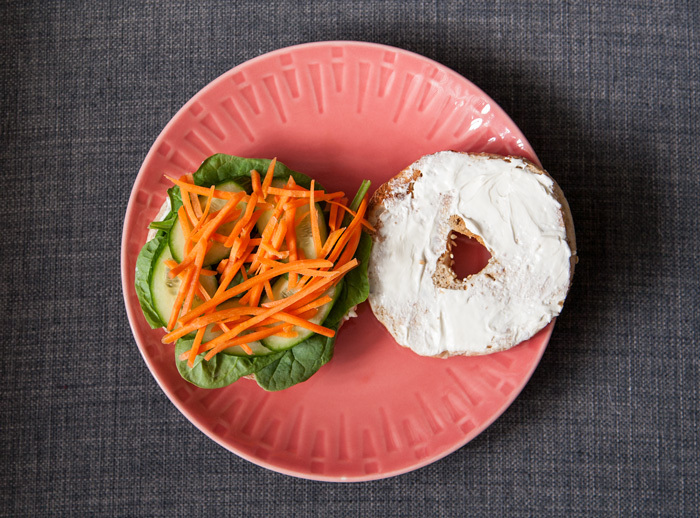 Toast a whole-grain bagel (or bagel-thin, for a lower-calorie breakfast). Schmear with light cream cheese or hummus, and top with whatever fresh veggies you like or need to use up. The combination pictured above is a personal favorite, baby spinach + cucumbers + shredded carrots, but other tasty choices to mix and match include alfalfa sprouts, avocado, tomato, arugula or baby kale. To finish with something sweet, here’s a simple make-ahead breakfast that happened to be the #1 most popular recipe on my blog last year. In this Steel-Cut Muesli, California-Style, the oats are soaked overnight in the fridge and eaten chilled, so they’re a great way to enjoy the benefits of oatmeal during the warmer months. In these photos I used a re-purposed jam jar, but it also works really well with half pint wide-mouth canning jars like these. They’re compact to stack in the fridge, so you can make a whole week’s worth in just one quick prep session! So that’s what I’ve been into for breakfast lately… but I can’t finish without an appeal to you, readers: come on, help me with my breakfast problem! How do you fuel your weekdays? Most of the time, I love to cook. But some nights, I wish dinner would just cook itself. Thankfully, I finally figured out the solution to my problem. And knowing myself, I really shouldn’t be surprised that it involves Instant Pot, my loyal kitchen companion. 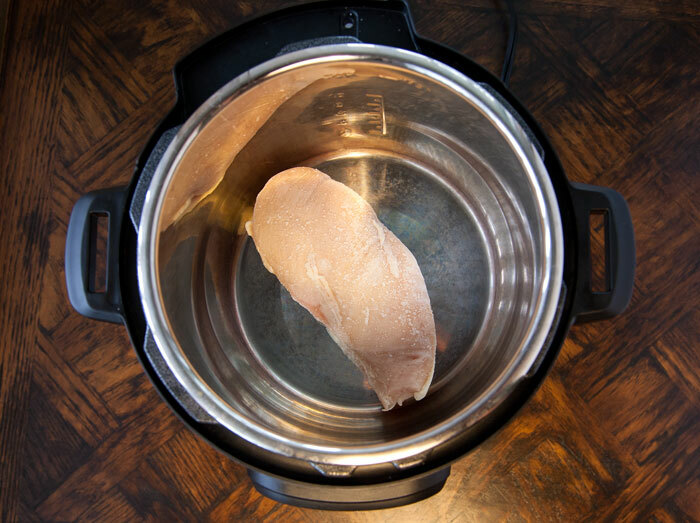 I’ve learned that with the magic of pressure-cooking, I can effortlessly cook chicken breasts from frozen. Yes, STRAIGHT FROM THE FREEZER! Each pound yields enough shredded meat for dinner + leftovers for 2. The chicken steams itself into tender, moist perfection with the help of whatever flavorful liquid your heart desires. 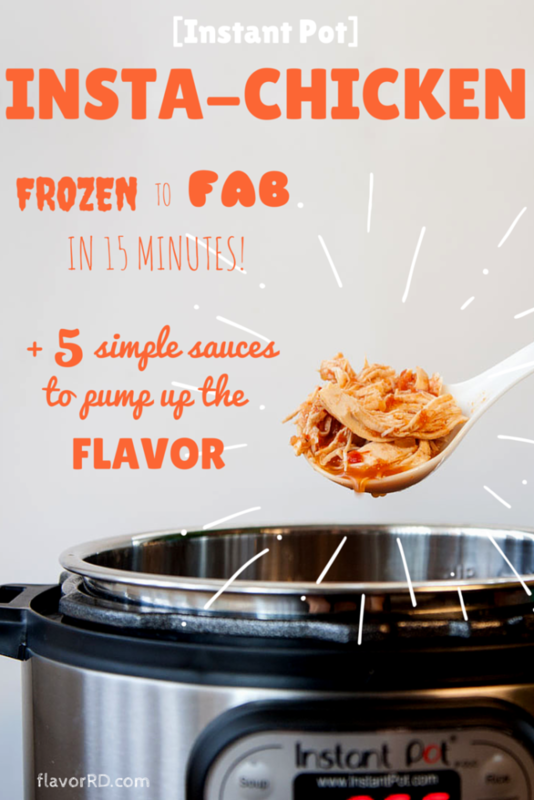 Along with the rest of my Instant Pot recipes, it’s really been a game-changer for my weeknight cooking. If you’re a fellow pressure-cooking devotee, read on for the simple steps! Start with about a pound of frozen chicken breasts. It’s difficult to tell, but this photo actually shows a single very large breast that weighs a full pound. Optimal cooking time is affected by the size of your chicken breasts (more on that later). Then decide what you’d like your chicken to taste like. You’ll want 1/2 cup of something tasty, and 1/2 cup of water to dilute. The possibilities are limited only by your imagination, and I’ll share some of my favorite combos below, but for this example I’m keeping it simple: storebought salsa! After you mix in the water to make a full cup of liquid, pour it over the chicken in your pressure cooker. Close the lid and set the cooking time based on the size of your poultry portions. On the low end of the spectrum, small 4-6 oz. portions of frozen chicken cook through in about 15 minutes, while the large 16 oz. cut above needs 30 minutes; if your portions fall somewhere in the middle, adjust accordingly. I’ve used both the manual setting and poultry program on Instant Pot, and have not observed any real difference in the results. After the cook time is up, let the pot rest for 10 minutes to naturally release pressure before opening the lid and and removing the chicken to shred it. 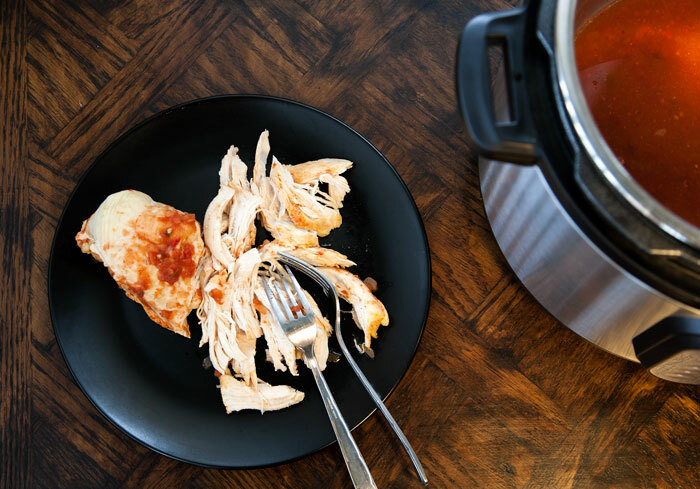 If by chance you find that your chicken is undercooked, never fear – just shred it as best you can and return it to the pot with Slow Cooker or Saute mode turned on until it’s cooked through. And tada! It really is that easy. This is a glimpse at the finished product from my post on Chimichurri in a Hurry. On weeknights, I throw the chicken and sauce into the cooker, and then begin my relaxed 30-minute countdown/meditation of figuring out what else is going into our dinner. I might be reheating leftover brown rice and chopping up fixin’s to top burrito bowls, or I might be toasting buns and tossing a side salad, or whatever else sounds good in the moment! Or on weekends, I can take a couple of minutes while I’m at home to cook up some healthy protein that I can bank on later in the week. For example, the salsa Insta-Chicken from these photos later went on to play a starring role in a killer taco pie / enchilada bake (you can thank fellow RD blogger at Fearless Flying Kitchen for the recipe). OK, I lied: I can’t stop at 5! I’m going to continue to update this post with more simple sauces whenever I try one that strikes my fancy. 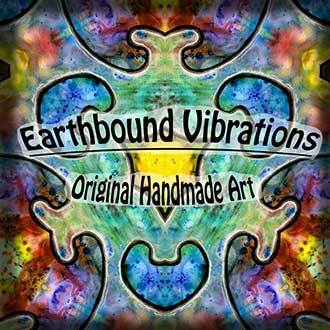 Fellow experimenters, I’d LOVE to hear about your successes in the comments! If you’re looking for more healthy + delicious food to cook up in your Instant Pot, check out my other recipes here! In a measuring cup or small bowl, mix together the water and flavorful liquid of your choice. 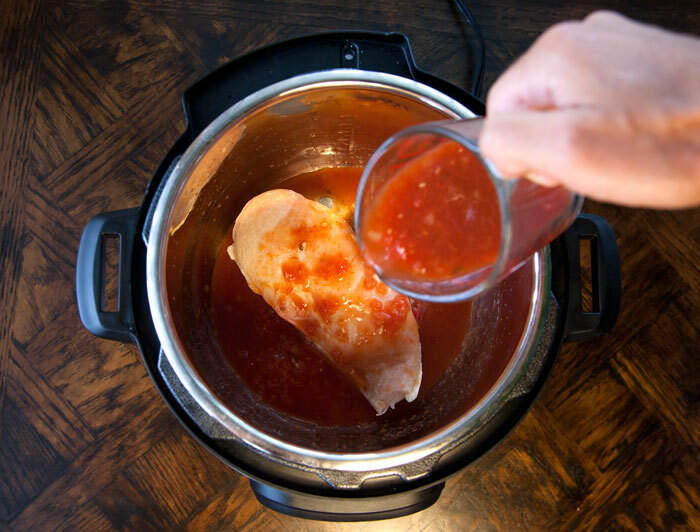 Place the frozen chicken in the Instant Pot liner, and pour the liquid over the chicken. Close the lid (with vent set to sealing position), press the 'Poultry' button and use the +/- buttons to adjust the cooking time. For standard chicken breasts (~4-6 oz. each), cook for 15 minutes; for extra-large chicken breasts (~1 lb. each), cook for 30 minutes. 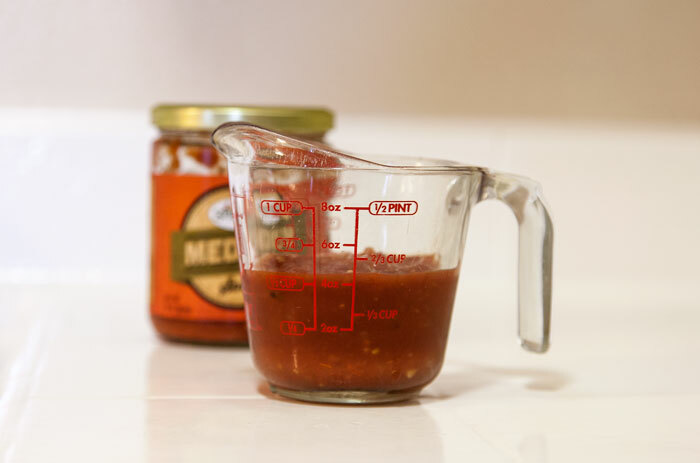 In between these two sizes, scale your cook time accordingly. After the cooking program completes, allow the pressure to release naturally for 10 minutes before opening the lid. If you're in a hurry, it is not hazardous to manually "quick-release" the pressure - but this may toughen the chicken's texture. Transfer the chicken breasts to a plate and shred into bite-sized pieces with two forks. 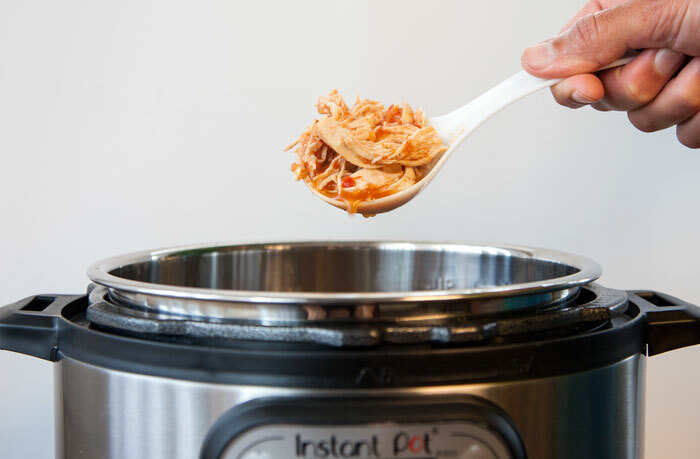 While you shred the chicken, you can optionally turn on Instant Pot's 'Saute' mode to reduce the sauce if it is too thin for your taste. Return the shredded chicken to the sauce and toss to coat. Ice packs. Netflix. 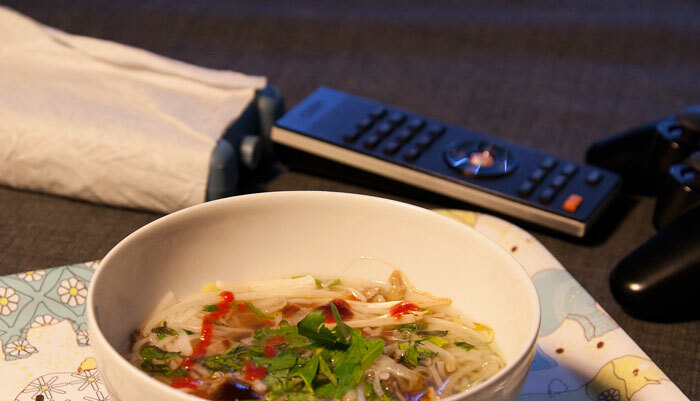 Eating soup on the couch. Sounds like a super-fun recovery weekend, right? This year I learned from my dentist that I needed oral surgery to correct a gum recession problem (PSA: apparently this is why you shouldn’t brush your teeth too hard!) and two weeks ago, I finally went under the knife to get it fixed with what they call the “pinhole” surgery. As the operation day approached, I put some diligent thought into how to best support myself nutritionally for a speedy recovery. It was obvious that I would need to stock up on soft/easy-to-eat foods, but from a dietitian’s perspective, I couldn’t help but draw up some plans to emphasize my favorite nutrients to facilitate the healing process. And it should go without saying, that I also wanted to continue to ENJOY food while I heal… gotta keep flavor in mind to nourish the body + spirit. Sure, you could say I’m ‘overthinking’ it for a relatively minor surgery – the doctor’s only dietary orders were to avoid crunchy and sticky foods – but on my follow-up visits, the surgeon praised my quick healing, so I’m thinking the effort was worthwhile! First off, for wound healing, it’s important to get enough calories and protein for your body to generate new tissue and heal. This means making an effort to eat well, to make sure that a sore mouth or poor appetite won’t lead to meal-skipping or under-eating. It also means paying special attention to build meals around healthy protein sources like eggs, lean meats/poultry, yogurt, beans, soy, etc. Vitamin C: An essential co-factor in the generation of collagen, this nutrient is key for healing tissue. As a bonus, it’s an antioxidant so it decreases systemic oxidative stress and consequently inflammation. Zinc: This mineral has a structural role in many enzymes, including several that are involved in pathways for collagen formation and in supporting the immune system. It’s clinically proven that adequate zinc status is important in aiding wound healing; in hospital settings, dietitians even prescribe zinc sulfate supplements to help patients with difficult wounds. I didn’t bother with that extra expense, but I did focus on eating plenty of my favorite zinc-rich foods. 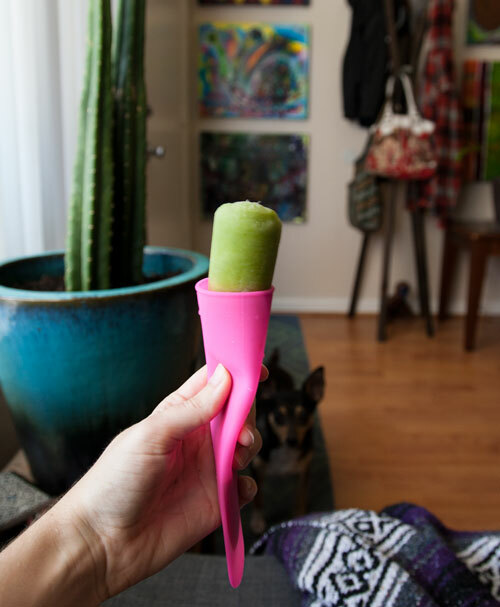 Behold, the Green Smoothie Pop. I received these fun squeeze-pop molds as a get-well gift from my mom (how sweet is that? she obviously gets me.). The day before my appointment, I whizzed up a mason jar magic bullet filled with frozen banana, frozen pineapple, fresh spinach, orange juice and almond milk, and poured the blend into the tubes to freeze. It was the right thing to do. Delicious tropical flavor, soothing cold for gum pain, and the pineapple and orange juice pack a punch of vitamin C for healing! Leading up to my surgery, I naturally ended up discussing the finer points of the mechanical soft diet with my dietitian coworkers. When the idea of crispy grilled cheese saturated with creamy tomato soup came up, I just couldn’t get it out of my head. During my pre-op grocery run, the first things to get tossed into my basket were a loaf of whole-grain sourdough bread, some lovely grass-fed sharp cheddar, and an ultra-convenient box of Imagine light-sodium Garden Tomato Soup. With the bread lightly brushed with olive oil for a source of healthy fat, this meal is easy to throw together when you don’t feel like cooking, and total comfort food. Win win! 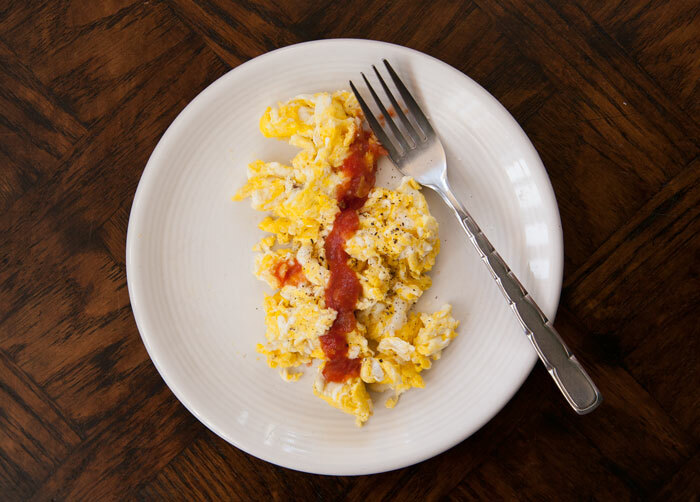 Scrambled eggs made appearances at both breakfast and lunch. They’re a quick/easy protein, soft, and topping with salsa doesn’t just up the flavor factor, but also adds a little extra veggies and vitamins. Every bit helps! PBJ yogurt! I had the surgery on a Friday, and after my first weekend of healing was over, this was my staple pack-for-work breakfast the following week. Plain Greek yogurt topped with a small spoonful of strawberry jam, a larger spoonful of chunky peanut butter, a tablespoon of wheat germ (zinc!!) and a generous sprinkle of chia seeds on top. So delicious, I’m still continuing to eat this now that I have my chewing abilities back. 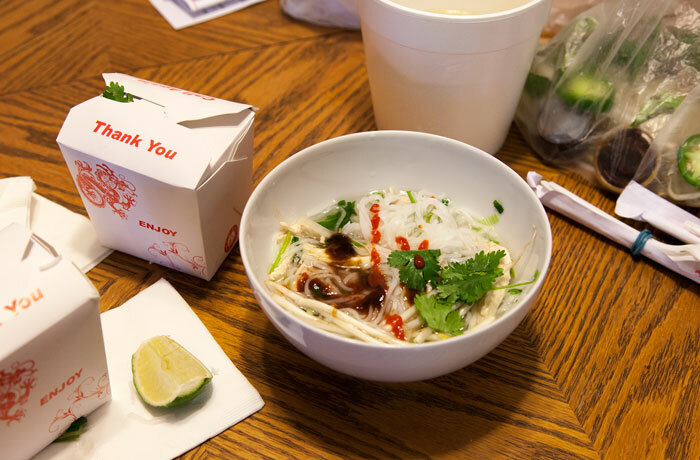 Just to be clear that I wasn’t powering through the recovery phase cooking everything from scratch: there was definitely a life-saving order of takeout pho. It’s the only ‘fast food’ I can think of built on a foundation of nourishing bone broth! I ordered extra and lived off this for the first couple of rough recovery days, when it was awesome to be able to just nuke a quick meal whenever hunger struck. 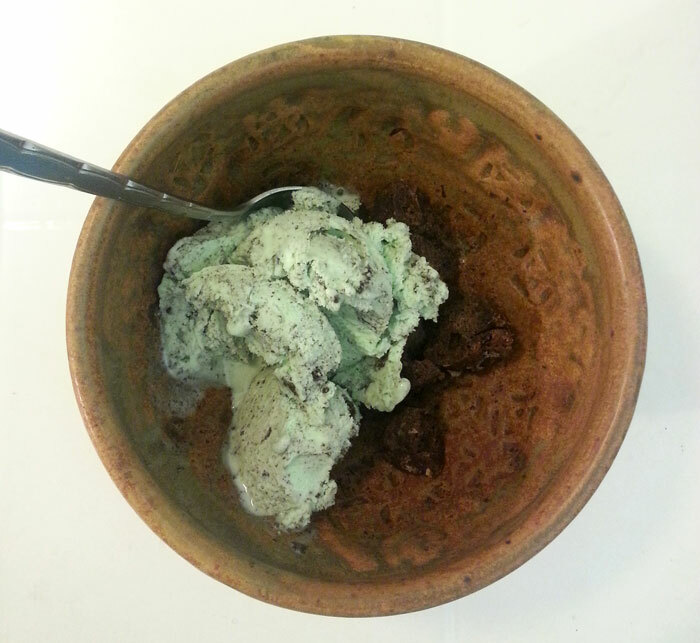 Annnnd just to be clear about one other thing, there was also definitely ice cream. Duh. Some other healthy foods that I subsisted on but wasn’t cogent enough to snap photos of: whole-wheat fusilli pasta topped with a grass-fed beef and mushroom bolognese, fork-tender broiled salmon, this black bean soup, this broccoli cheddar soup, and a simple chicken ‘noodle’ soup with tiny star-shaped pastina that made me feel like a little kid again. Lots of good eating, and although I’m still waiting for clearance to start flossing again (as a flossing fanatic I’M GOING CRAZY OVER HERE!) I’m pretty much back to normal now! I hope this post will help other people trying to figure out what to eat after oral surgery. If you have any other words of wisdom, please share in the comments! 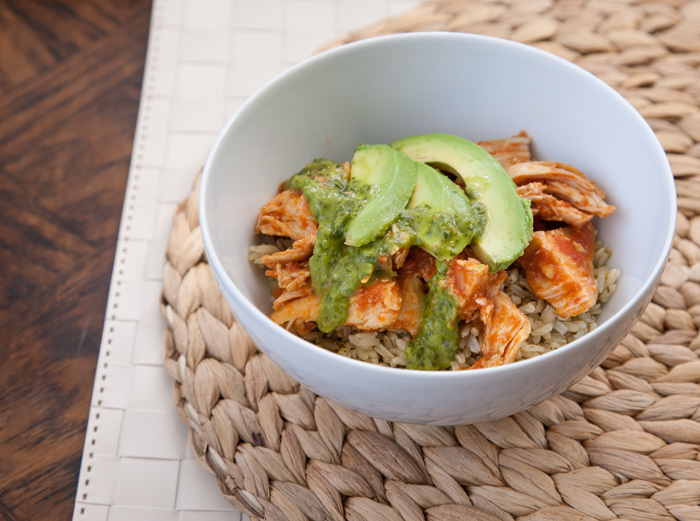 Already have enough recipes for healthy, easy, one-pan, perfectly balanced weeknight dinners? Yeah, I didn’t think so. 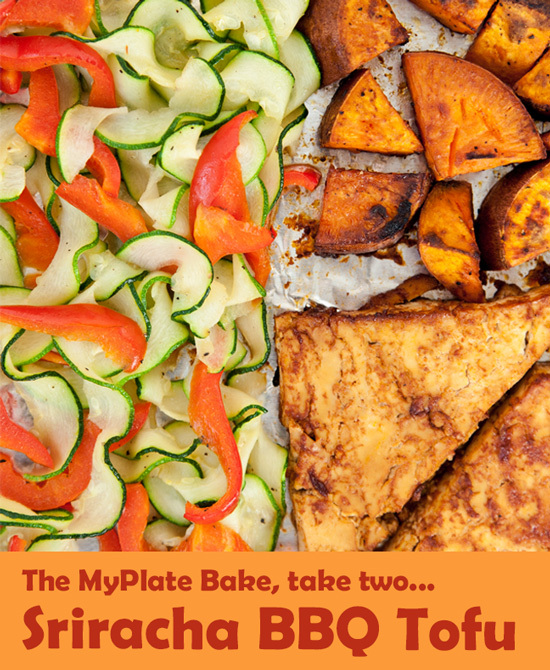 So here comes variation #3 for my National Nutrition Month series of MyPlate Bakes… and this time, we’re packing some major superfoods! 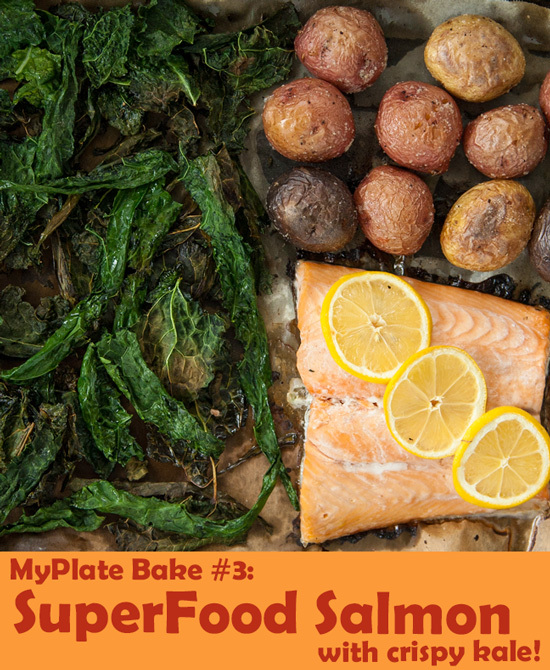 This one-pan-meal is filled to the brim with omega 3’s, leafy greens, antioxidants, fiber, protein, potassium, along with your recommended daily allowance of deliciousness! Ready for take two? In case you missed it last week, this is the second installation of flavorRD’s special feature for National Nutrition Month. 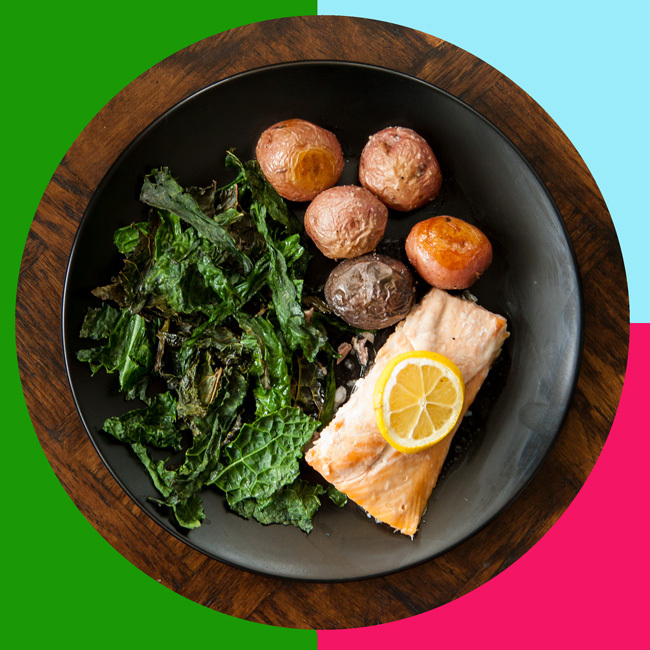 Every week in March, we’re biting into a healthy lifestyle with a new balanced recipe inspired by USDA’s MyPlate: the idea is that 1/4 protein + 1/4 carbs + 1/2 veggies = healthy dinnertime success made easy, all on a single sheet pan. This time around, we’re catering to the plant-powered people out there! Whether you’re vegetarian, vegan, or just trying to work in some Meatless Mondays, this spicy sweet garlicky goodness is a full-flavored way to power up your weeknight dinner table.